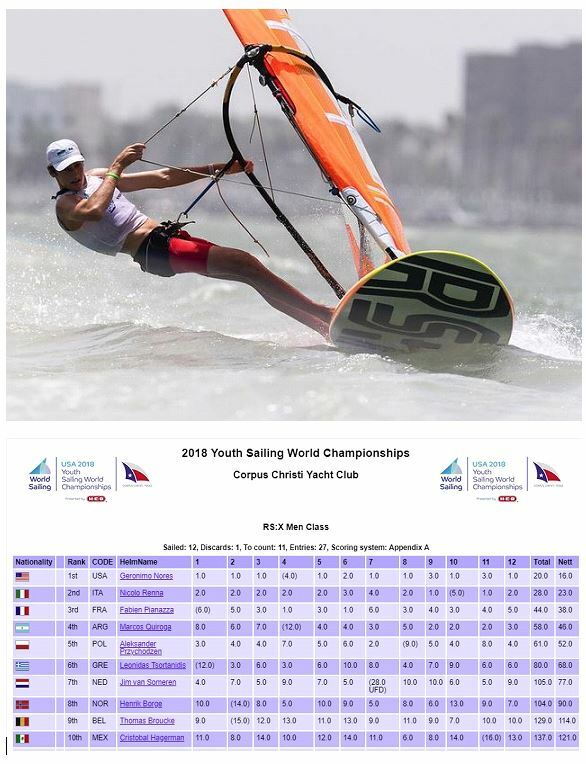 The Youth Worlds has become the pinnacle sailing event for teenagers aged 16-18. Past gold medalists have gone on to very successful careers in the upper echelons of the sport. 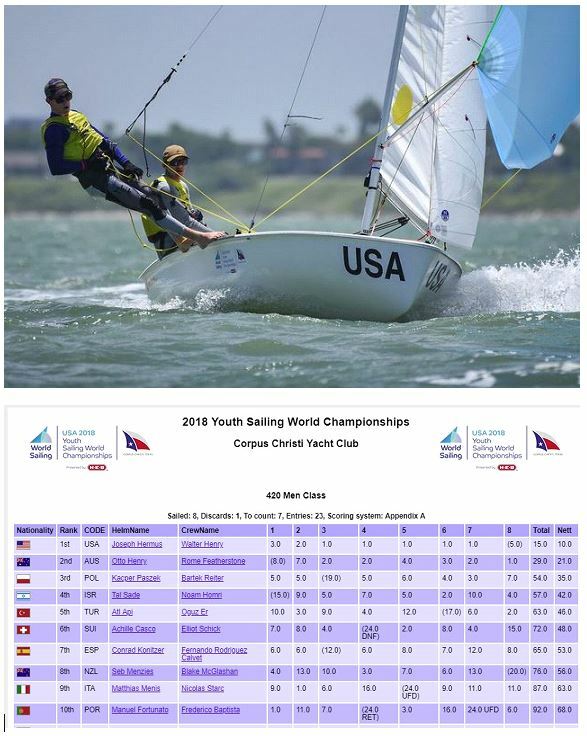 Whether American Geronimo Nores (Boys' RS:X), Islay Watson of Great Britain (Girls' RS:X), Argentinians Teresa Romairone and Dante Cittadini (Nacra 15), Josh Armit of New Zealand (Laser Radial Boys'), Charlotte Rose of the U.S.A. (Laser Radial Girls') and Joseph Hermus and Walter Henry (USA) (Boys' 420) follow in those footsteps remains to be seen. Tonight they're reveling in the fact that they've won a gold medal at a world championships with one race to spare. Nores leads the Boys' RS:X Class with 16 points, good for a seven-point lead over Italian Nicolo Renna. Nores scored eight wins in his 11 counted races and is discarding a fourth. Although he doesn't have to sail tomorrow, he still plans to. "It feels great. I'm very excited," said Nores. "All of the preparation we did in terms of windy sailing, non-windy sailing board preparation, gear preparation, coaches… it all came together. Sometimes it comes together, sometimes it doesn't. I'm lucky that this is one of the times that it did." Nores only resumed sailing a few months ago after spending close to eight months combating a severe case of diabetes. He was racing in Europe last year when the disease struck him hard. He has a working canine, Luna, by his side at all times to alert him if his blood sugar levels drop dangerously low and also wears a patch on his arm to help regulate the levels. "This is my first international podium in a while," said Nores. "For everything to work out is a long time coming. There's a lot of personal satisfaction in this." Watson won the Girls' RS:X Class on the strength of three first-place finishes today. She began the day in third place, three points off the lead, but leap-frogged Veerle ten Have of New Zealand and Giorgia Speciale of Italy after dominating on the water. 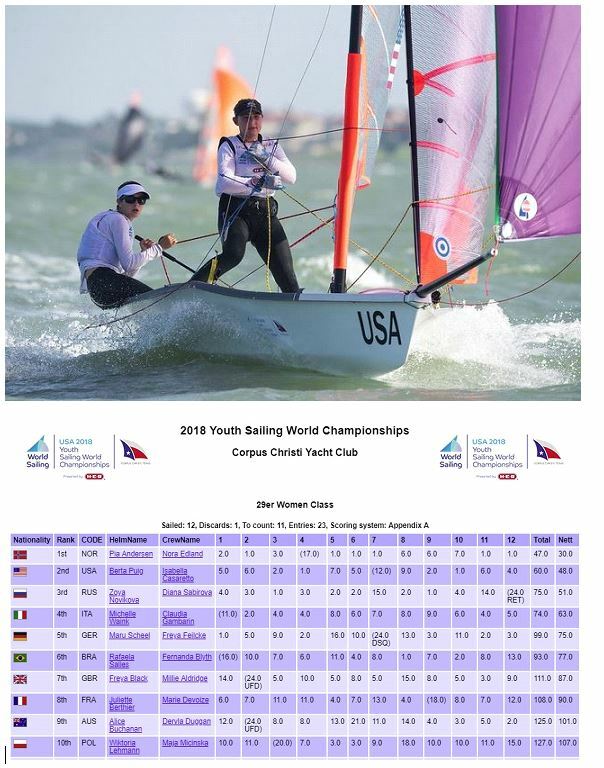 It is Watson's first Youth Worlds and first gold medal. "It was a cool day, great conditions. They suited me and I made the most of it," said Watson. "I knew I was only a few points away and I went into the day thinking I can get three firsts and get up there. And that's what I did." Watson, ten Have and Speciale have had a great battle all week, never separated by more than five points. Watson said the windy conditions suited her style and she kept improving each day. "Today my downwinds were a lot better and I didn't make many mistakes on the laylines. That's what kept me in front," said Watson. "I'm pretty tired at this point. The days have been long; a long week with big conditions. It's been tough." In the Nacra 15 Class, Romairone and Cittadini warmed up for the Youth Olympic Games in October by slaying the class. Romairone raced the Youth Worlds last year in the 29er Class and placed 18th. This year, Romairone and Cittadini have 10 top-three finishes and a fifth in their scoreline for the low score of 26 points, good for a 33-point lead over Greta Stewart and Tom Fyfe of New Zealand. With 24 entries in the class and their discard currently a sixth, they can't be touched. Next to clinch their class victory was American Charlotte Rose in the Girls' Laser Radial Class. 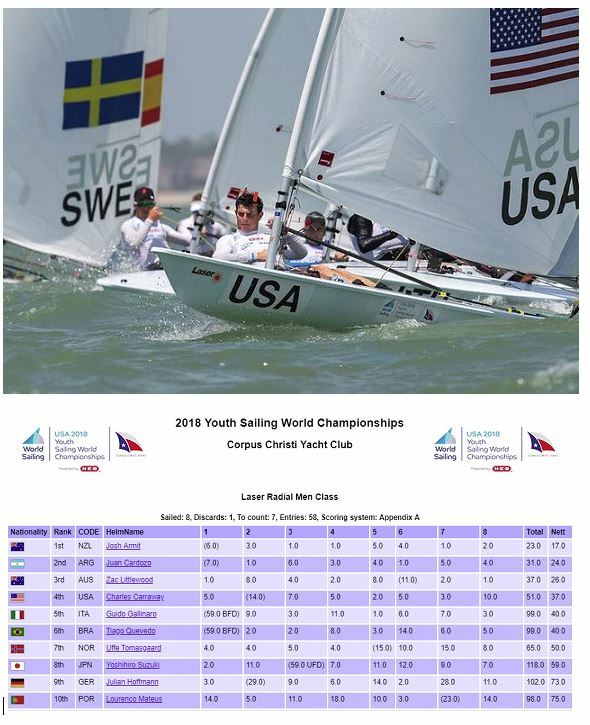 Rose won both races today and holds an unassailable 11-point lead over Emma Savelon of the Netherlands. Upon returning to the boat park Rose plopped down on the pavement and let out a big sigh. Her hands were torn to shreds. "I'm exhausted," said Rose. "My ratchet block broke in between races and we didn't have time to replace it. I was just hanging on for the second race." The ratchet block helps prevent the mainsheet from running out when the sheet is loaded up. That Rose was able to sail without it in 18- to 22-knot winds is testament to her strength and determination-she was last year's gold medalist and focused on making history. "No one in the past 10 years has won this class twice in a row, so it's a great feeling," said the 17-year-old Rose. "In my head I put in so much time and effort that I know I deserve to win it as much as anyone else." New Zealand's Josh Armit kept the gold rush going by grabbing the Laser Radial Boys' title. A 1-2 ensured he goes into tomorrow' final race with a seven point cushion over Juan Cardozo (ARG) and Zac Littlewood (AUS). Next it was JC Hermus's and Walter Henry's turn to clinch gold in the Boys' 420 Class. The American duo finished 1-5 today. The fifth-place finish becomes their discard and they have the low score of 10 points, good for an 11-point lead over last year's gold medalists Otto Henry and Rome Featherstone of Australia, who seem assured of winning silver. "It feels great," said Henry. "Everything came together at this event. We've been sailing together for two years and have had lots of ups and downs, but it all paid off." Hermus had to lose 18 pounds in the past month in order to weigh in for the regatta. "Losing weight was the sacrifice," said Hermus, who's on leave from the U.S. Naval Academy. "I lost the weight through dieting and running. I guess the Navy helped a bit that way." In the Boys' 29er Class, Norwegians Mathias Berthet and Alexander Franks-Penty increased their odds of winning the gold medal by posting a 2-1-5 today. 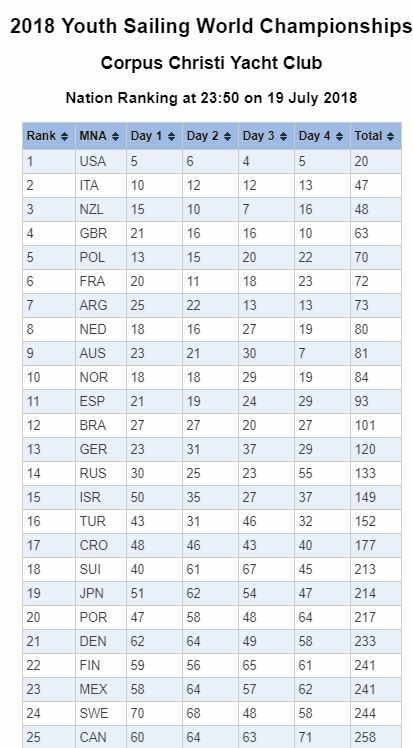 Berthet and Franks-Penty have totaled 34 points and lead Seb Lardies and Scott Mckenzie of New Zealand by 10 points and Australians Henry Larkings and Miles Davey by 15 points in third. The Norwegians compatriots in the Girls' 29er Class, Pia Andersen and Nora Edland, also hold the lead in their class. They trailed Russians Zoya Novikova and Diana Sabirova by three points entering the day and then went out and posted a 7-1-1 to regain the lead with the low score of 30 points. The Russians finished 4-14-15 today to tumble into third place which allowed Berta Puig and Bella Casaretto of the U.S.A to ascend to second place. 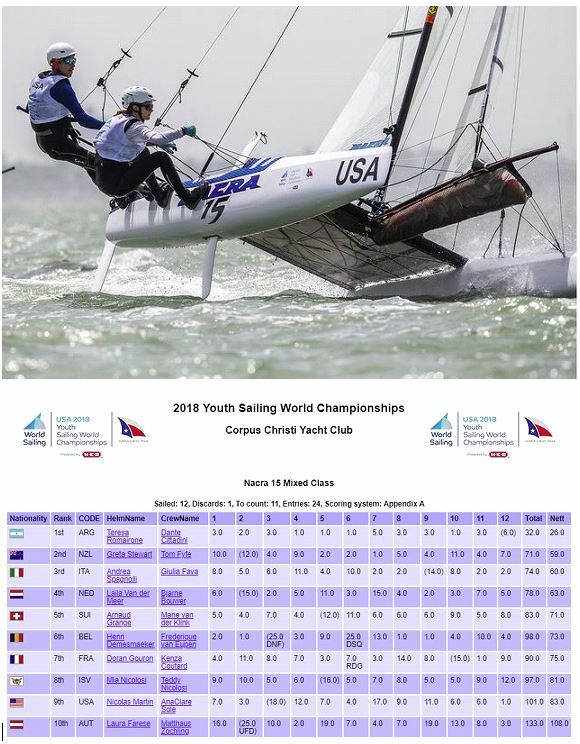 Puig and Casaretto have 48 points and a three-point cushion on the Russians with one race to sail. 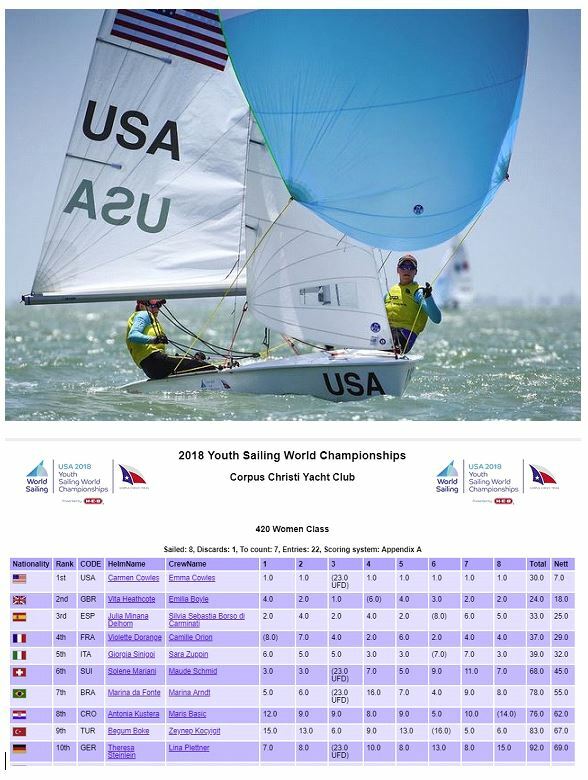 In the Girls' 420 Class Carmen and Emma Cowles are on the verge of winning their second consecutive gold medal. They won both races today and hold an 11-point lead over Vita Heathcote and Emilia Boyle of Great Britain.